#1 This is not a simple update. They do not import your current site into a new version. You will have to completely rebuild your site from the ground up. You will need to choose a new template, customize the template, and manually add all the content from your existing site. 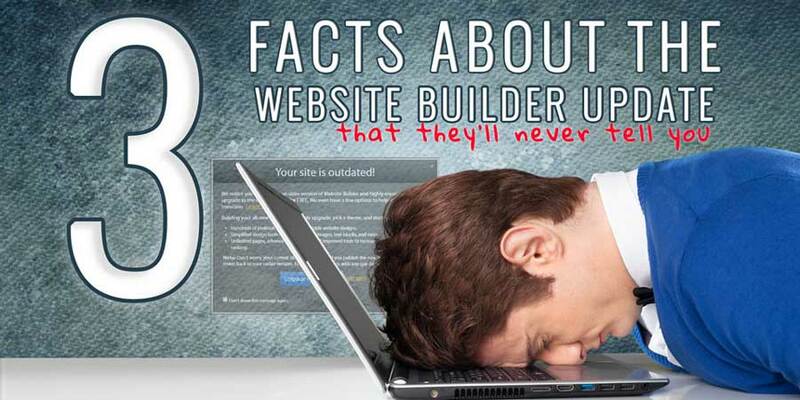 Do you recall all the work that went into building your site in the first place? #2 Version 6 is being retired. #3 Not all features will be available. As you can see in the message above, even though version 7 is supposed to be better, it’s currently missing some features that you might require. Additionally, while the new editor is arguably a better tool, you will face a learning curve. The new editor functions in a completely different way so again, you are starting from scratch. Below are a few options you have for handling this upgrade. As with most things on the internet, there are probably hundreds of options, but below are the top three in my opinion. 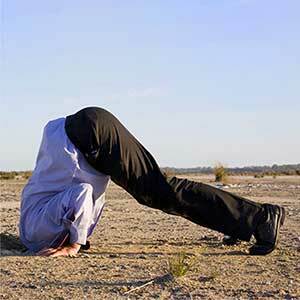 For now, the update is just a recommendation. Originally they were going to force the upgrade, but due to the lost features, the backlash was too great. Now they have, at least temporarily, changed it to a recommendation. 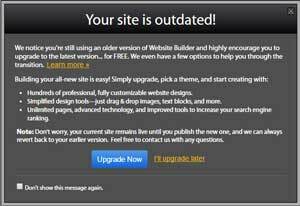 Of course, your website will remain outdated, and there’s no telling when they will force you to upgrade in the future. Considering you’ll need to upgrade at some point, it probably makes sense to do it sooner than later, because you’ll start receiving the benefits of a more modern website as soon as you upgrade. If you purchased the website builder through GoDaddy™, you could get their facelift package. My understanding is that the cost of this is $199-$399, depending on how many pages you have. They also have complete web design packages that run from $499-$2499. Okay, so now we’re getting down to brass tacks. You’ve probably already guessed that, while I am a nice guy who likes helping people, I’m not taking time out of my busy schedule to write this article just to help you avoid an unpleasant upgrade experience. I have an ulterior motive. If you are unhappy with your site, frustrated that you have to learn a new system, or just agree that your site is outdated, you might decide it’s time or a change. My basic website package is a great bridge between the do-it-yourself builder and hiring a webmaster. The website is professionally built for you, and then you can use an easy drag-and-drop editor to make future changes or updates. Not only does this save you all the time and frustration of creating the site from scratch, it also means that your site will have the look and performance of a professionally-built website—because it is one. Okay. I could go on for pages about all the reasons I think my package is best, but it doesn’t really matter at this point. If you’re happy with what you have, you’ll probably choose one of the first two options. If not, check out the info below. If you replace your site with one I build, I think you’ll be shocked at the difference in quality. To prove my point, I’m willing to create a mockup of your site at no cost, with no obligation, no credit card, and no BS! Fill out the form below and I’ll send you a temporary site that, while not complete, will give you a great vision of what your new site could look like. Note: These mockups are custom-created and may take a few days. By the way, if you are coming to this article because of an email you received, you can just reply to that email and ask for a mockup. If you have questions or want more details, feel free to contact me. **We are not affiliated with GoDaddy™. GoDaddy™ is a registered trademark of GoDaddy.com, LLC.